Traditionnal classic keel boat, 7.5 m long. The Architect boat! Attention: this boat may be built only with a numerically cut plywood kit. After many years on « sail and oars » boats, and some others on a raid boat (Stir-Ven), I wanted for my own use a keel boat able to sail the same coastal cruising I sailed when I was young. I also wanted to propose a new boat in my catalogue between the centreboarder Méaban and the 8.5 m Toulinguet. A boat big enough to allow a fortnight cruise. But I wanted it very easy to handle, even single-handed, and not requiring a diesel engine, an electrical windlass and all those items now so common but which result in a large and expensive yacht. A small boat gives more pleasure and less trouble. Pen-Hir is the result of 4 years of thinking. My goal was to draw something in the same spirit as the American knockabouts designed by Alden and Crowninshield, very simple, fast and handy sloops. Similar boats were sailing in the Morbihan Gulf (8.5 m SI class), designed by Louis Dyèvre and Gaston Grenier. I was also very fond of Herreshoff designs with their extreme pureness. All those boats were in use during the first third of the 20th century, but I needed a boat suitable for modern use. The cabin had to be larger and the boat wider. Finally Pen-Hir has the looks of traditional yachts of Brest and Carantec areas, with a plumbed stem and a short counter, but keeps the gaff sloop rig with a small bowsprit. I like the gaff sloop with a high peaked yard which is efficient and allows to step the mast in the tabernacle without external aid. A modern bermudian rig is also available on buyer’s request. The size of Pen-Hir, 7.5 m hull length, and its weight allow to trail it. She is fitted with two strong eyebolts allowing to handle the boat with a crane as for Dragon class boats. The accommodation is similar to Méaban, but with more room, a larger galley and a semi-separated toilet. The mast is set on a strong but open bulkhead, just at coachroof fore end, thus non obstructing access to fore berth. All traditional yachts have a classic keel with the rudder attached at the aft. On modern boats, we always try to reduce the wet area and therefore to have a fin keel and a separated rudder. On Pen-Hir, I was very concerned about both performances and the ability to dry out on legs, which makes it possible to avoid calling in modern marinas. I made drag calculations and these show that the number of appendages is a major factor. In other words, a classic keel-rudder is one appendage only, whereas many modern sailing boats have 3 (keel and 2 rudders). A classic keel also gives a more effective lateral resistance, in particular at slow speed, thus being ideal for manoeuvring under sail in confined waters. 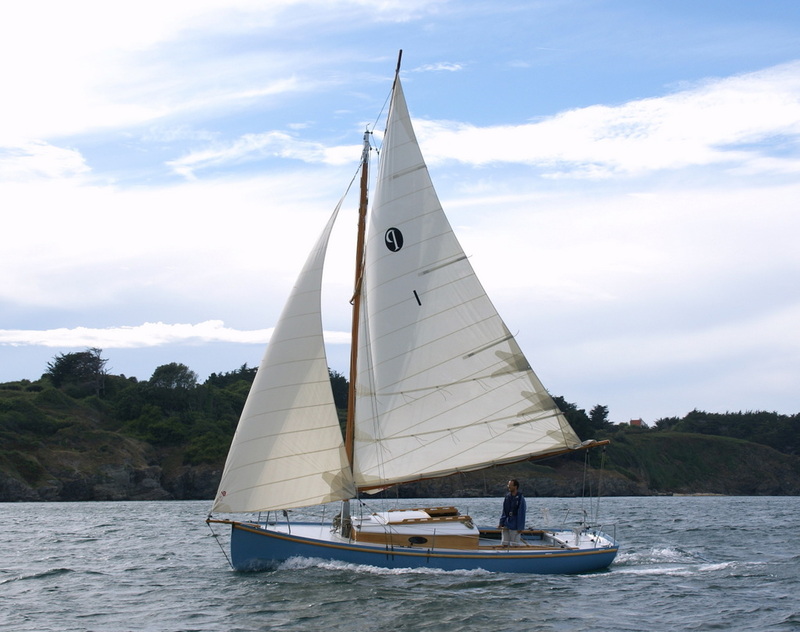 Finally, the short classic keel, with the tiller at mid-cockpit, combined with a well canvassed rig, appears to be an excellent compromise for a boat requiring easy drying out. In addition, it reduces dramatically the risk of rudder damage. At owner’s request, the draught may be modified to cope with local mooring conditions. The NC cut plywood structure. As many others of my designs, the structure of Pen-Hir is made of criss-crossed plywood bulkheads, including the vertical keel. This allows Icarai boatbuilder in Cherbourg (my own son) to have the boat ready for planking, including most of her accommodation parts, two weeks after receiving the NC cut plywood panels. The bottom planking is made of one single developed plywood panel. The bilge and sides are made of two layers of cold moulded 6 mm plywood. See here the assembly process and the pictures of construction. The boatbuilder and I have decided that the first Pen-Hir will be built respecting sustainable development, as much as possible, and we have launched a research and development program with several laboratories. We chose to exclude all tropical woods and in particular okume or mahogany plywood. The boat is made of first class Finnish birch plywood which is extremely resistant and stiff. The only drawback is that birch, as okume, is not a durable wood. Therefore the hull and deck are epoxy sheathed and all edges properly protected. All main timber parts are made of oak, in particular the coachroof coamings. Pine is also used in the accommodations. The mast and spars are made of Douglas fir. Of course, Pen-Hir may also be built with common marine plywood and red wood as timber. In the same ecological spirit, I have decided to use an electric propulsion. It is based on a new 2 kW Torqeedo Cruise R outboard motor giving a thrust equivalent to a 6 hp petrol outboard. A remote throttle control is located in the cockpit at helmsman’s hand. The motor is tilted in the aft well, so there is not any speed loss when under sail. Four gel type batteries (100 AH), located under fore berths, allow a range of about 20 nautical miles at 4 knots on a quiet sea. The motor is mainly intended for harbour access and manoeuvering but may also be used to come back to shore if the wind falls down. Batteries can be charged either by the means of a vertical axis windcharger or from harbour electric power. The aft motor well may also receive a petrol outboard at owner’s choice. Be the first to review “Pen-Hir” Click here to cancel reply.